Anglesey Adventures and Coasteering Wales at Anglesey AdventuresRock ClimbingAnglesey Adventures is an adventure activity company that provides Adventure Days, and skill based Mountaineering and Climbing courses throughout Snowdonia and North Wales. We pride ourselves on using enthusiastic and experienced local instructors who are there to give you an outing that you will remember for adventure, quality, excitement and enjoyment. In order for our clients to maximize their time, and gain most from their experience, Anglesey Adventures adopts a low client to instructor ratio on all our programs and events. 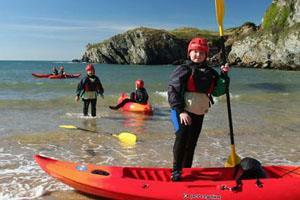 We offer a range of Adventurous Activities for you to choose from when planning your trip or event in North Wales. Some of the activities that we offer may include Coasteering , Gorge Scrambling, Rock Climbing, Abseiling, Mountain Scrambling, Sea-Level- Traversing, Kayaking, Raft Building and Canoeing.